Dry skin or allergies are often the cause for itchy paws. Treating them early can help prevent licking and more irritation. 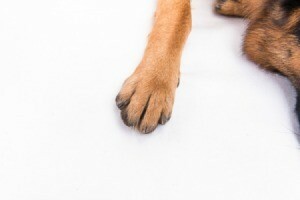 This is a guide about remedy for a dog's itchy paws. I have a dog that constantly chews on her feet, causing a problem with discoloration and yeast. I was getting frustrated using the sprays on her paws from the doctor. I found a better solution by having her stand in a bathtub filled with Epsom salts and baking soda (roughly a 4:1 solution) while giving her a bath. Hello, your dog is bored, that is why she is chewing on her feet. Give her more things to do. Or maybe if you have space, let her run, or take her for walks to tire her out. You can also try Emu Oil, that stuff works great for skin and hair. Every summer my three year old dog has problems with itchy feet. His feet start to itch, and he lays and licks the hair off until they get red. The vet has no idea what's wrong? I got something online last year that helped and of course I can't find it. His blood brother has no problem. It has to be something that won't hurt him when he licks it. Please help us. I have a dachshund mix named Banjo who is super allergic to everything "summer" If there is even one flea on her then breaks out in allergy so she takes Comfortis at the vets which does not need a prescription, and it gets rid of fleas. I would give her from now on, each day, a about 1/4 tsp of cooking oil in your hand and see if she will lick it off. I would make sure the dog food she is eating has more protein in it, the real kind of protein for the summer months. A lot of the dog foods that do not have meat alone listed in the first ingredients have lots of allergens in them. Some people have suggested to give the dog boiled chicken for a few days to see if it is just their food that is bothering them. Give the dog about a spoonful of plain unflavored yogurt, this helps with yeast, and don't give any people food. I would either go to the vet and get a shot for the dog or give it Benadryl, 1 mg per pound of body weight. You can give 2 mg per pound of body weight but I never do that much. Poor baby. Summer is so hard for them to deal with. Chewing on feet can be a sign of yeast problems on the skin. There is a shampoo that the vet can give to get rid of surface yeast on the skin of dogs, you have to bathe them every week in it. It really helps and if it is a yeast problem there is a couple of pills the vet can prescribe. Bless you and good luck! Do you fertilize your lawn in the summer? Many dogs are allergic to commercial nitrate fertlizers and will itch until they no longer have contact with it. Folks I know have solved the problem by switching to organic fertilizer. My dog licks his feet every spring. He does this because he has allergies. The licking and biting is a response to not being able to attack his allergy areas, ie. head area, back, so he licks and attacks his paws. Try having him tested for environmental allergies with your vet. Or start with benedryl tabs of 25mg. Ask the vet FIRST!!! Is there an over the counter cure for persistent toe licking? It seems to be moisture driven, ie., lots hair on feet and lots of snow outside. If you use salt or chemical to melt ice on your driveway or chemical in your lawn STOP! this might be the reason your doggy's paw gets irritated, dry and cracked. If you have no choice but to continue using the chemical then you probably have to wash his paws every time he get back in the house. If this is purely cause by the cold weather try to goop up some Vaseline cream on the paws and between the toe nightly to keep the paw moist so it will not crack or dry up. Maybe get a doggy shoe for when he go outside. My dog chew on their paws too when they went outside in the snow but it just because they were trying to get the snow off from their feet and to lick their feet dry. If the licking or chewing is persistent try "Sour Apple Spray". You can get this spray from the pet store. It just taste sour to dog so if you spray it on their paws they wouldn't want to chew on them anymore. I'm sure there are other brand that will do the same with the different name. Just look around you'll find something there. Trim the fur back on dog's bottom of feet. I have cocker spaniels and do this monthly. It will help to keep pads drier. Also, more difficult for burrs to get attached. Good luck. My Cocker Spaniel after going on a walk in the woods cannot stop chewing her feet. She keeps running in circles and kicking out. I have checked for thorns and whilst I found one and removed it, it does not explain this behaviour. She is of working breed and is in the hedgerows all the time. My other Cocker doesn't seem to have this problem. Please help? Athlete's foot spray - any kind. Dogs get this same as humans. I haven't tried on feet yet but have advised amber colored listerine as it kills fungus. My dog has itchy feet only in the fall. What can I use to stop the chewing on the feet? I have a three year old white Bichon/Poodle. For the past two or three weeks he has chewed on his feet until one of the pads is partially chewed off. I have taken him to the vet. He was given a shot of something, it didn't work. I have given him Benadryl and that hasn't worked. Any suggestions please? Tea tree oil is the magic of all first aid treatments. Apply to any itch, bite, scratch, cut, or abrasion, on human or dog and it will work. It is the very best antiseptic available, has no side effects and is completely safe. Apply to the dogs feet to help the itch and also to help heal what ever is bothering the feet. Perhaps he's picked up some kind of fungus or other contact dermatitis. Well, I definitely agree about the tea tree oil and also watching out for cleaners on the floor, etc. I have heard some pretty bad things about some of the Swiffer chemicals, etc. Also, when my Dobie has had hot spots that he chews on, it's because he's eating food with corn in it, or he needed to be wormed. I've read that spraying diluted organic apple cider vinegar on animals' itchy/chewy "hot spots" will soothe. Also, what others have said about changes in cleansers and chemicals is true. Allergies could be a cause, too, like grass for instance. Dogs can be allergic (or become allergic as they age) to grass. My sister's dog Storm was miserable most of her life, until they moved into their 3rd home that in a deserty area with no grass in the yard. After spending thousands and thousands of dollars on vet bills and meds that didn't work, after they moved into their new home Storm's skin and itch cleared right up! Try to massage them with olive oil to relieve the itch. It will not harm the poor baby if he licks any off, but it will calm the itch. I agree it sounds like something he is walking across that is the root of his problem. When I mop I use hot water and a few drops of lavender oil. I run a small rescue that is funded only by my SSD, so I can't afford high priced stuff anyway. But this works and makes your home smell good as well. I read somewhere on this site about Epsom salts or baking soda helping with dogs biting on their feet and having sores. You were suppose to soak their feet in this solution. I can't find where the directions for this are. Could someone please help me? My dog, a Newfoundland and Border Collie mix, spends a lot of time biting his feet. 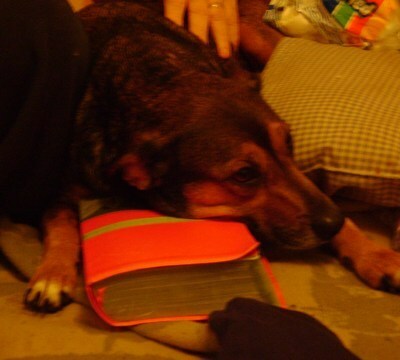 The vet recommends Benadryl and Prednazone to stop it. I would like to find a natural and healthier solution to the problem. Can anyone help?